You have to be running Windows 8.1 on your device, though, as Windows 8 isn’t supported. If you do qualify, however, using this feature seems to be very straightforward. 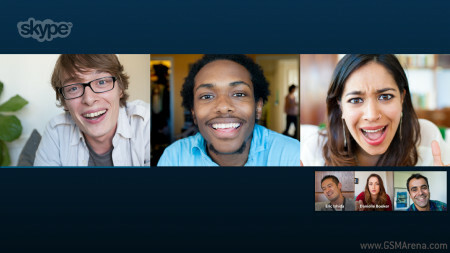 You can video chat with up to ten people at the same time, but only the three most talkative members of the call are shown on the screen at the same time (like in the image above). Any other participants will have their video shown once they start talking. That said, if you want to see a specific person that isn’t talking at a particular moment, you can just double tap on her or his face and they’ll instantly go full screen. And to go back to seeing everyone, you double tap again. The reason for the decision to show only three people at a time (plus yourself) apparently has to do with a study that Skype conducted, which found out that most group video chats involve three to four persons. Details about how all of this works are available in the promo video below. As you can see, if you want to do other things on your tablet while you’re engaged in such a group video call, you can resize the Skype window and multitask away.